In the event that you were to conclude a transaction that involves a car, then you will want to make sure that the right type of receipt is issued. That is why it is important for you to learn how to make a car receipt. This article will give you all the information you need in order to properly make one. Before you even begin making the receipt, you have to know why you’re even making it in the first place. Does a person wish to buy the car? Then that means you’re going to have to issue a car sale receipt. Does the person wish to rent it? Then you’ll need to issue a car rental receipt. So basically, knowing the purpose will help tell you what information you should put into it. When making just about any kind of receipt, it is very important that you are able to include the information on the business that’s responsible for issuing it. Other than its complete name, you will need to provide additional information such as contact details and address. Also, it’s best that you include the business’s logo into the receipt. If you are going to issue a receipt to someone, then it is very important that you do not forget to include that person’s basic information. Having it on the document will prove the identity of the buyer. So all you have to do here is to put in the buyer’s complete name, as well as additional information such as address or contact details if necessary. It is very important that you do not forget to include the date in which the receipt was issued. Remember that the document can potentially be used to prove when exactly the transaction took place or was concluded. So when writing down the date, be sure to include the month, day, and year. If you’ve received a vehicle order prior to the transaction, then you should have no problem with this. If not, then what you will need to do here is to put in the information regarding the car that is to be sold. This means that the receipt should be able to tell the model of the car, its make, the color, and more. Next is where you will need to put in the payment details. This will depend entirely on the type of transaction that the parties are involved in. So if one were to simply rent the car, then you’ll need to point out how much needs to be paid for every month or even week. If the transaction is a car purchase, then you’ll need to consider the tax and any other variables that factor into the total payment. If you’re going to sell a car to any buyer that wishes to purchase it, then you are going to have to provide proof of the transaction. 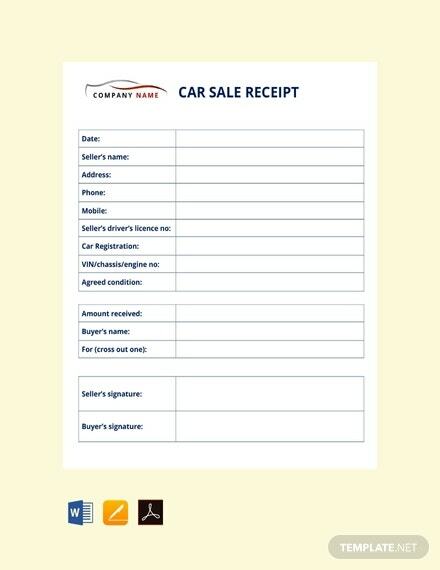 So when the time comes that you do, you’ll find that this car sales receipt template will definitely come in handy. Just put in the information it needs and both you and the buyer will have a record of the exchange. 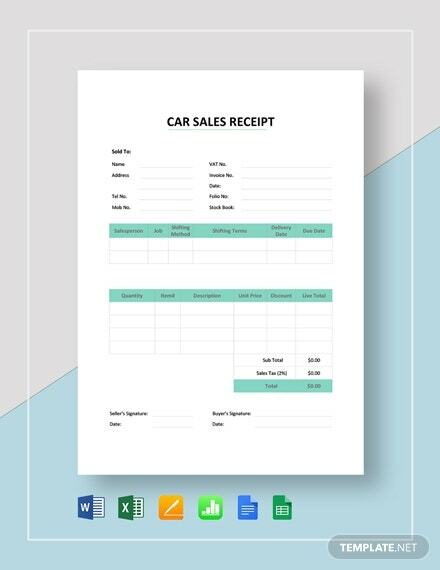 If you are going to make a car sale receipt, then this is the template that you will want to download. Once you have it, all you have to do is to put information such as the name of the buyer and seller, the type of care being sold, when the transaction took place and so on. There are times where you will want to make a car receipt in the quickest and easiest way possible. With this particular template, not only will you be able to make a receipt in the most efficient way, but you can also guarantee that it has everything it needs to act as proof of transaction. 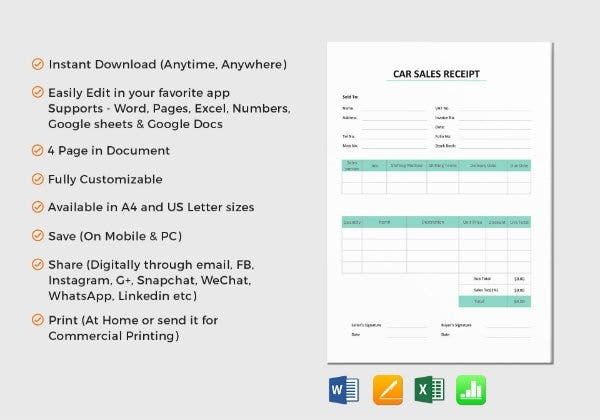 Should you wish to make a car receipt, then know that this template is always available for you to download at any given point in time. Once you have it, choose either Microsoft Word or Apple Pages to open and make whatever changes you want until it becomes the receipt you need it to be. Instead of purchasing a car, some people go with the option to rent one instead. 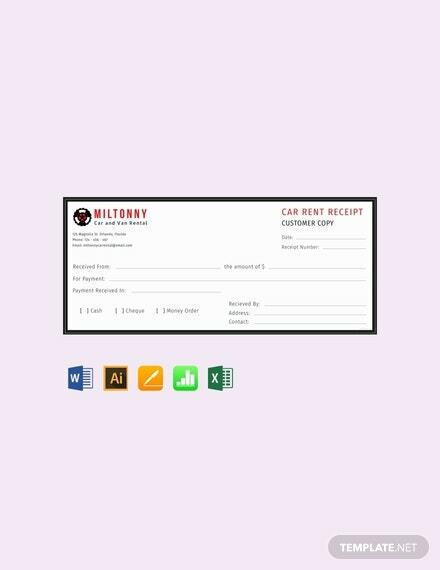 If you are in the business of renting out vehicles to those that need them, then you’ll find this car rent receipt to be very useful. 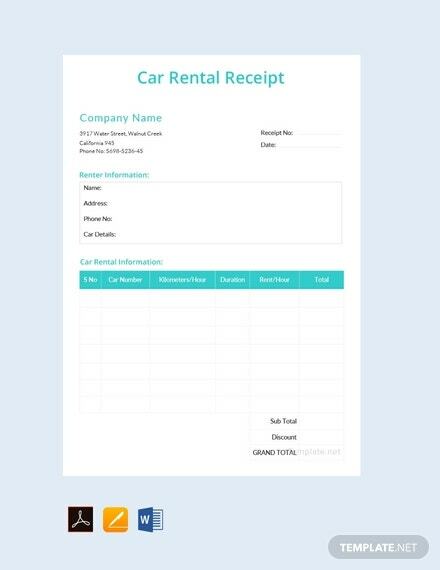 Use it to make a document which points out details such as what car is being rented, the payment terms, the identity of the other party and more. 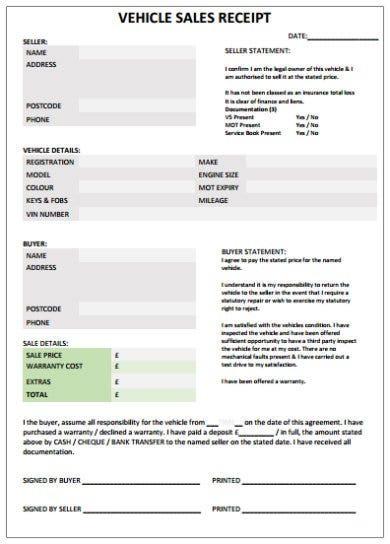 If you want to get straight to the point when it comes to providing proof to a car-related transaction, then you should definitely use this template. Once you have it, just make sure that you are able to provide it with the information that both you and the buyer will both need.